two summers ago i made this blanket of an average cotton yarn, hook size 2,5-3 mm. for the blocks i changed the pattern of a hexagon into this ‘there is nothing special to it’ square. 2. ss to first chain space of row 1. make 3 ch and 1 dc in first space, *2 ch and 2 dc in next chain space*, repeat between * * till end of row, end with 2 ch and ss to third ch. 3. ss to first chain space, make 3 ch and 2 dc in first space, *(2 ch and 3 dc in next space) twice, 3 ch and 3 dc in next space* crochet between * * 3 times, end with 2 ch and 3 dc in next space twice, 3 ch and ss to third ch. 4. ss to first chain space, make 3 ch and 2 dc in first space, 1ch, 3 dc in next space, 1 ch, in the 3 ch space you create a corner: **3 dc, 2 ch, 3 dc**, *(1ch, 3 dc, 1 ch in the next space) twice, (**make a corner**)*, crochet between * * 3 times, end with (1ch, 3 dc, 1 ch in the next space) twice and ss to third ch. fasten off. 5. if you want a larger square, just repeat row 4 until desired size. 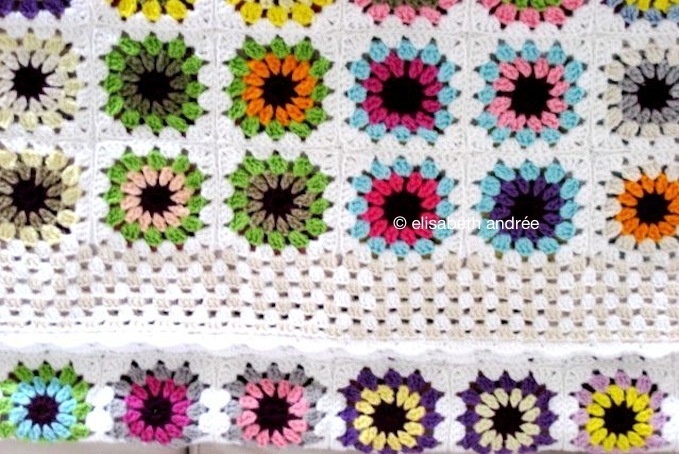 Categories: crochet, tutorial | Tags: blanket, square, squares, tutorial | Permalink. Beautiful blanket! I’ve been working on a blanket for almost a year! Well done! @ Kathleen: Thanks for stopping by and for your kind comment! How sad for your friend and what a good friend you are for making these squares. Your color plan seems great! Success with it and thank you again! now that i have several squares done.. can i ask how you attached them? sc or sew? @ Kathleen: It is been a while since I’ve made this blanket, but I almost never sew crochet work. For this blanket single crochets are a good option. The afghan is very pretty. Thank you for sharing the pattern. To answer your question: I can not remember, but I think – when I look at the pictures – it’s a few rows of alternatively three double crochets and 1 chain. And all around it a wavy row. Sorry, it’s a few years ago and I’ve crocheted it without a pattern. Thanks for the border information. I have made a dozen or so squares and I think this is one of the prettiest things I have ever made. Just love the combination of the dark centers, bright ‘petals’ and white ground. Can’t wait to see how it turns out. 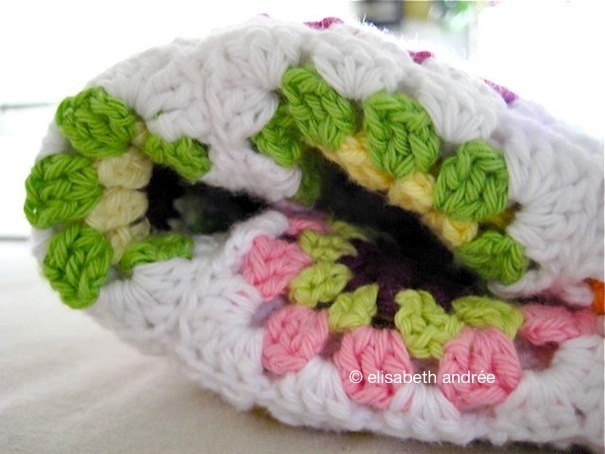 Your Blanket looke beatufil, i just have one question, what is a Magic Loop and how do i make one. I have never heard of that term before. The magic loop or magic ring is a replacement for the chains you close with a slip stitch when you make a square or something round. There are many tutorials. If you search on Google ‘how to make a magic loop’, you can find tutorials on Youtube, but also written tutorials with photos. You can make a choice according to your preferences. After 50 years, I still I love to crochet. In fact, it really is my “first language.” I plan on making this beauty. My sincerest compliments for your creativity, but for mine…I will be adding a complimentary color with a 5th row to each square…to aid squaring and to frame each flower in something of a trellis that will show off each individual flower. The white is lovely, but it is just way too much white for me. going around the bottom of the Floral Afghans > Black Eyed Susan Squares. They almost look like little butterflies. I have no instructions for making the blanket, only for the squares. It’s been a few years since I made ​​the blanket and I have no notes. Maybe you could take a look at the comment of Brooks Ann Miller above and my reply to it, maybe the info is helpful.